Who is the greatest living essayist writing in English? Joseph Epstein would surely be at the top of anybody's list. Epstein is penetrating. He is witty. He has a magic touch with words, that hard to define but immediately recognizable quality called style. Above all, he is impossible to put down. 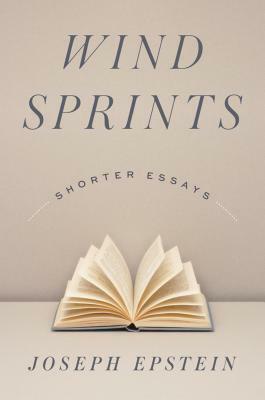 Joseph Epstein's Wind Sprints: Shorter Essays is the third volume of essays from Axios Press following the much acclaimed Essays in Biography, 2012 and A Literary Education and Other Essays, 2014. It contains 142 short essays, literary sprints rather than marathons. Subjects range from domestic life to current social trends to an appraisal of "contemporary nuttiness." After reading Epstein, we see life with a fresh eye. We also see ourselves a little more clearly. This is what Plutarch intended: life teaching by example, but with a wry smile and such a sure hand that we hardly notice the instruction. It is just pure pleasure.